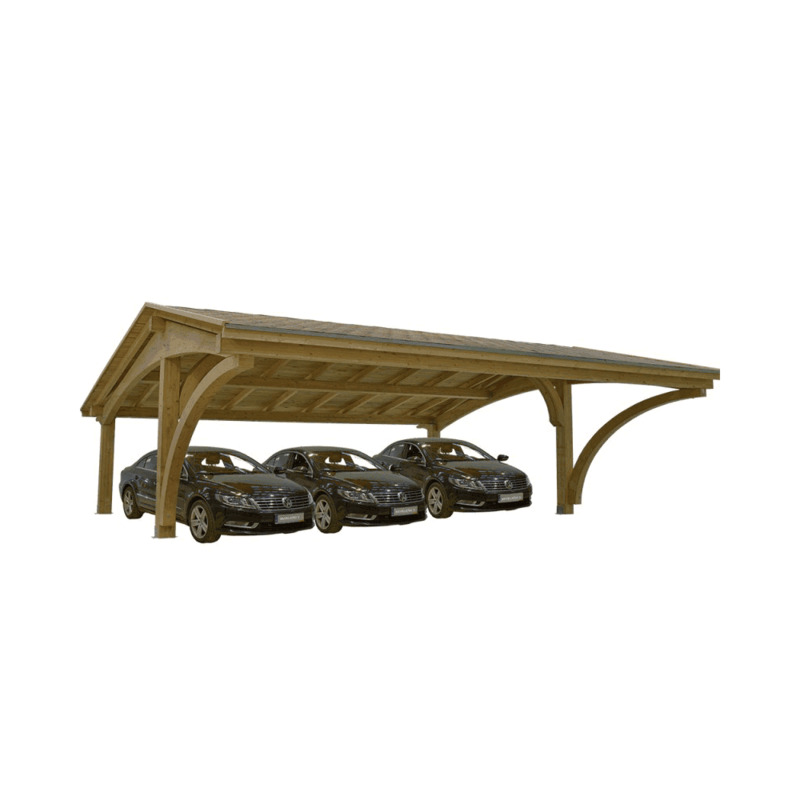 Jagram Revelatio III Triple Carport: The Jagram Revelatio Carport is a large, sturdy wooden carport that offers luxurious and spacious cover. The attractive design with curved wooden elements and coloured bitumen felt shingle roof tiles make this a nice addition to any garden or driveway. The large roof protects against a range of hazards such as tree sap and inclement weather, providing a sheltered and safe space beneath for your cars or workspace. All wooden elements are responsibly sourced Northern European Softwood, and are treated with Jagram's advanced formula wood preservative to ensure and guarantee for ten years against decay, weathering, and insect attack. Wooden elements can be painted or stained to your preference, and shingle tiles are available in either red, brown, green, or black colour. The strong support posts are fitted into strong metal supports which are cemented into the ground for safety and stability (see images). This strong and versatile carport is a practical solution to your outdoor cover needs, and will be a valuable addition to your outdoor area for years to come.